Yesterday afternoon at the Scandinavia House, board members of the National Book Critics Circle and other critics presented on select writers participating in this year's festival. The authors they discussed are from Germany, Mexico, Egypt, the Basque country of Spain, and Zimbabwe, and their comments were valuable supplements to other World Voices events. Supplement feels like the wrong word to use; each panelist gave a highly informed and contextual introduction to the authors discussed. Rather than essaying too much on it, I'll give a selection of annotated transcriptions from each of the five talks (in two parts) for those who couldn't make it at 4 pm on a weekday, and who may have heard some of the related panels. Eric Banks, NBCC board member and freelance critic, gave a really interesting talk on the post-wall generation of German-language writers, linking them together with broad strokes in terms of what has informed their writing and language, specifically, while suggesting that a richer understanding of their work can be had without seeing them as part of a generation or, perhaps, even as German. He mentioned the interest over the past year in authors who grew up in East Germany before the wall came down, such as Clemens Meyer (who gave an incredible reading a couple of hours later at the Deutsches Haus, and my account will be on the blog early this coming week), and suggested that this year's World Voices curation is reflective of that, in giving an introduction to authors who came of age around 1989 or afterwards, and are poised to find an American readership. In suggesting how to look at these writers, Banks ended with a pun on the title of Walter Absih's novel How German Is It: íIf we were thinking about an older generation of German-language writers, we might want to say, èhow German is it,' but when looking at some of the writers on this year's panels, you really want to ask, èHow is it German?'" Rigoberto Gonzalez, NBCC board member and poet, provided an arresting picture of the íintellectual border crossersë of Mexico, specifically Álvaro Enrigue. He spoke of three groups of Mexican writers on our radar: those working in Mexcio and translated into English (Octavio Paz, etc. ); Mexican-Americans who have been publishing in the states since the early '60s (Sandra Cisneros, Gary Soto), and aren't really Mexican or American; and the border crossers. In his introduction, he suggested that the diversity of these groups and their isolation from one another reflects the complicated history of the country's relationship with the United States, and that this is something we'll have to deal with, whether or not we're in a time when íthe buzzwords are èillegal immigration' and èswine flu,'ë because by the year 2050, people of Mexican origin will make up one-third of the US population. 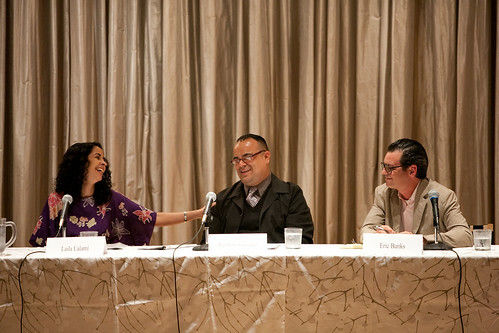 Gonzalez voiced the concern that audience members interested in discovering this author won't be able to find his books in English. Very little of Enrigue's work is available in translation, which Gonzalez finds hard to believe. "I'll end with a plea,ë he said, íto translate the works of Álvaro Enrigue past and future. What he will bring to American letters is incredibly valuable to many communities. To those of us who want to add a relevant and fresh vision of Mexico to their libraries, and to the Chicano writers who will recognize a long-lost cousin in Enrigue, a writer who will bridge two literary landscapes: the Mexican and the Chicano, which have been mutually exclusive for much too long.